The Canadian Society of Landscape Architects (CSLA) Awards are sponsored by the Canadian Society of Landscape Architects together with provincial associations. 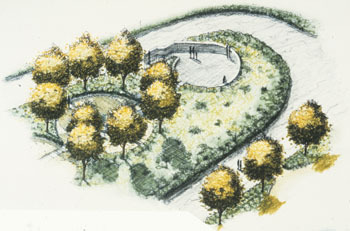 The purpose of the awards is a) to recognize and promote excellence in all aspects of the profession; b) to communicate a strong awareness of landscape architecture as a profession to related professions, potential clients, and the general public; and c) to build an accessible record on a year-by-year basis of Canadian landscape architectural work. The CSLA Awards celebrate professional creativity and excellence on an annual basis. Complete information on submission, jury selection, and a record of awards along with images is available at the Canadian Society of Landscape Architects/L'Association des architectes paysagistes du Canada website. Entries can fall into various categories: Research, Planning and Analysis, Design, Landscape Management, Communications, New Directions, and Residential Design. Awards are made at the national and regional levels. Awards include: Citation Award for particular superior qualities deemed worthy by the jury; Merit Award for excellence in some juried categories; and Honour Award for overall excellence in all jury criteria. The CSLA Awards archives came to the University of Guelph Library due to the initiative of Professor Jack Milliken, a member at the School of Landscape Architecture who first proposed the idea to the CSLA College of Fellows. Slides, images, and many other documents of the award winning projects have been forwarded annually for placement into the library's archives since 1998. The University of Guelph's holdings of the Canadian Society of Landscape Architects Awards projects covers the years 1987 to the present. Files are arranged chronologically and alphabetically by name of project within each year. The collection has over 600 projects, many of which include photographs, phonotapes, slides, video, diskette, monographs, letters, entry forms, and jury comments. More recent projects have submissions and images on disks. The Canadian Society for Landscape Architects Awards has been catalogued in the University of Guelph Library's electronic catalogue, PRIMO. More than 600 records in the archival holdings can be viewed at the following catalogue link. Full records include project names and dates, format and quantity of materials, clients and related persons, and a brief description of the contents of files along with the library's call number indicating the location of the records. The library also holds a small number of related historical materials on the CSLA; however, the main CSLA fonds is held by Library and Archives Canada.